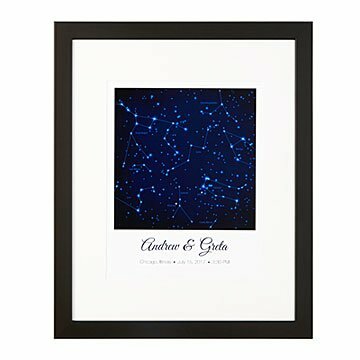 Remember the moment just as it was with a personalized night sky featuring star charts from a specific date. Freeze time and remember the moment just as it was the first time you met, when he proposed, or the night you drove your newest bundle home from the hospital. Inspired by family camping trips spent staring at the stars, Amy Evenson of Wausau, WI uses computer software to plot star charts from your specific date and then custom illustrates that night's sky. A beautiful reminder of life's picture-perfect moments, the constellation is further personalized with your names and the date of the celestial scene. Printed in the USA. It would have been nice if a card was included describing the art and the artist. I would have liked to include that with the present. My sister & her husband LOVE this gift!!! I have not seen the gift yet so I don't have any opinion now but they love it which is the most important thing to me! This was a Christmas gift commenarating my granddaughter's wedding day. Fast delivery, beautiful product. My parents loved it. Decor for entrance to home. Thank you for the unique personalization I requested. This made our 45th anniversary perfect. I've been married for 20 plus years. I purchased this to hang in our bedroom after we moved. I chose the day/place/ time of my first meeting with my husband. Looking at it makes me smile, remembering that special day. The colors, font, paper used and framing are perfect and of fine quality. It's worth it's cost. I plan to purchase one of these for each of my daughters when they marry.